All Progressives Congress, APC candidate for Warri South Constituency 1 in the 2019 elections, Prince Stanley Oritsemolebi Emiko, has felicitated with the Nigerian Football Federation, NFF and the entire Super Falcons, including their technical crew for emerging African Champions for a record 9th time. Prince Emiko in a terse statement made available to Fresh Angle International immediately after the difficult encounter with the Bayana Bayana of South Africa, posited that the victory by the Nigerian female senior National team is even more heartwarming, considering the fact that they lost to the South Africans in their first game at the tournament. The APC House of Assembly hopeful commended NFF President, Amaju Melvin Pinnick for rebuilding confidence in Nigerian National teams and setting up structures toward the financial independence of NFF. 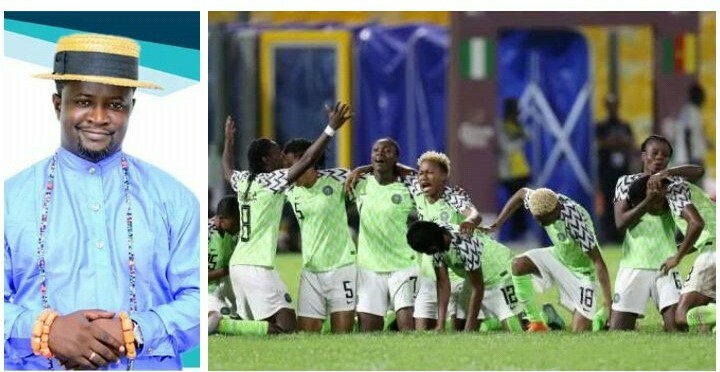 He enjoined the technical crew of Super Falcons to scout for younger players as the team prepares to lead other African teams to the next female world cup, so as to record good outing at the Mundial. Prince Emiko appealed to people of Warri South Constituency 1 to support his 2019 legislative ambition, promising to initiate legislation that will ensure proper development of grassroots sports in general.